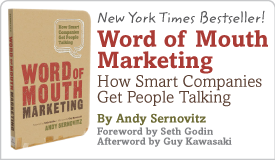 #3.04: The "Get Your Customers To Sell For You" Issue | Andy Sernovitz | Damn, I Wish I'd Thought of That! When’s the last time you agonized over your supplier for laser printer toner? It’s the kind of product you buy often and without much thought. InkSell.com sells ink (duh) at a steep discount, and they make it incredibly easy for their customers to do the selling for them. Every time you place an order, you get an instant 10% discount if you send a 10% coupon to a friend by email. The simple one-screen form rewards you for rewarding your friends. Very smooth. They don’t make you log in or fill out a complicated form. It takes a few seconds to send the discount, and the form appears in a small pop-up window that doesn’t interfere with your shopping. Even better, when the order arrives, they give you a stack of coupons with a code for another 10% off your next order, enough to pass around. THE LESSON: Everyone likes to share a good deal with friends. Make it easy and your best customers will be your best advertisers. National marketers have offered to subsidize advertising by local merchants for decades. J&R Electronics does it even better (and cheaper) by ghost-writing email advertisements that its affiliates can send out. Every few weeks, J&R sends its affiliates on the Linkshare network a cut-and-paste email message that each affiliate can send out to the affiliate’s customers. The message is a ready-to-forward email advertisement “Brought to you by ‘Your Website Name’ in affiliation with JandR.com.” For smaller marketers, they get a well-designed, professional-looking promotion offering unique deals to their customers — with no design costs or effort. J&R gets hundreds of merchants all pushing the current promotions, without having to buy national advertising. The marketers appreciate the help; the merchant appreciates the marketing. THE LESSON: Help your affiliates help you spread the word. Give them ready-to-use tools that make it easy for them to sell for you. Every two-bit politician knows that nothing beats a great speech in front of an eager crowd. It builds loyalty — and it tells your core fans that they are part of something big and exciting. Microsoft has more than 250 events planned in the next eight weeks. They host everything from “90 Tips in 90 Minutes” for business users to conventions for hard-core software developers. At a live event, your customers meet each other, giving them the important knowledge that they are not alone in choosing your product. It’s also an efficient way to let your customers meet your staff, putting a human face on what might otherwise be a remote relationship. THE LESSON: Bring your most loyal customers together as often as possible. Reinforcing this community creates a network of loyalists who will fight forever to defend the merits of your products. Where are all the CEOs going to be at Internet World? Hundreds of CEOs have done some of their best deals at GasPedal’s CEO-only dinners. Why not take a break with a hand-picked group of your fellow CEOs for this no-hassle, no speeches, kick-back-and-relax schmoozefest. Join us as we refresh, recharge, and continue to rally for a strong recovery. Let’s get together and deal our way to success. We guarantee good food and good company — new friends and folks you haven’t seen in ages.